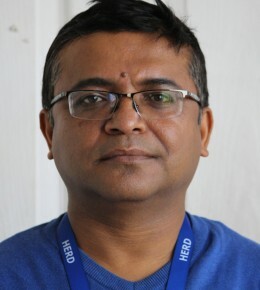 Mr. Rajesh Ghimire, in his twenty years of career in the media and NGO field, has donned several hats from that of Media officer in United Nations Mission in Nepal (UNMIN) to a mainstream journalist, a photographer to writer, editor, project manager, event manager and documentary filmmaker, to name a few. His extensive experience of working with Nepali Media has resulted in a widespread network of contacts, which serves as an excellent resource. Over the years, Mr. Rajesh has been engaged in numerous public health issues (reproductive health, HIV/ AIDS, tobacco cessation) in the capacity of a media advisor, manager and journalist. Media Advisor- Health Research and Social Development Forum (HERD): As Media Advisor, Mr. Rajesh’s responsibilities included drafting of media strategy, implementation of the strategy and media mobilization for the organization. Project Coordinator: Mr. Rajesh worked as Project Coordinator for Sustainability Watch, an international network of 15 countries in Asia, Africa and Latin America. It works towards monitoring and advocacy of Millennium Development Goals (MDGs) and promotes the localization of MDGs through civil society participation. As the project coordinator, Mr. Ghimire was responsible for facilitating the international network. [Jan 2006-July 2007]. Mr. Rajesh also worked as a project coordinator of Rio+10 Project, which analyzed, lobbied for implementation of Sustainable Development Agenda in Nepal (Jan. 2001 to Nov. 2003). Environmental Justice, A book on situation of environmental justice in Nepal (2005). Climate Change: Understand and Communicate- Booklet, Synopsis of toolkit written in Nepali by renowned scientist Dr. Tirtha Bahadur Shrestha, and published by Government of Nepal, Ministry of Environment (2012). Climate Change and Public Health- A book focusing on the issues of climate change and its effect on public health especially on the reproductive health of women. Published by NEFEJ on June 2012 for WWF-Nepal.